If you follow me on Facebook, you know we had a lot of fun at church yesterday. 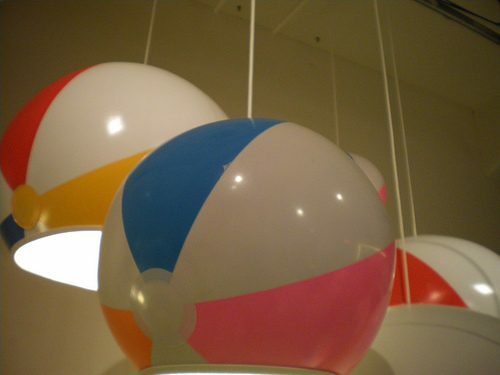 At the end of the service, beach balls descended from the ceiling of our auditorium. Standing beside my daughter, I pushed aside any fleeting thoughts of “You can’t play in church!” and joined my daughter in running into the aisles to chase after balls, tossing balls to others, and hitting away any balls that entered my space. Mostly, I grabbed as many balls as I could to give to her to throw. She captured the experience with one word, whispered to me as the balls settled and the pastor closed in pray: Awesome. It’s a Sunday morning I’ll not soon forget. We all need to infuse more playful, joyful,and fun moments into our lives. We all need to infuse moments of fun into our social media interactions. I’ll be honest, I’m not sure exactly how to do this: My life is somewhat serious. I work hard. I’m focused and driven. It’s likely that those qualities or characteristics shine through my use of social media. Even if your brand is more suit and tie than flip-flops and roller coasters, you need to put on your blue jeans every now and then and throw some beach balls in the air. Paint your toenails mint green. Bring cotton candy to a business lunch. Whatever fun looks like to you, express it! How can you have fun online? Will you do it, today? Look for ways to infuse your social media updates with playfulness, smiles, and light. Send out some fun, playful updates on your social media channels. You may want to post a “just for fun” blog post, or share a funny photo. Or send out some fun tweets. Break out of your usual routine. Don’t be afraid to laugh out loud. A note: It’s all fun until someone gets hurt. I am mindful that some people take this way too far, and in doing so may harm others or damage their brand. Always exercise common sense in sharing content online. Be respectful and responsible, realizing that we write online in permanent ink. Tell me something! How do you have fun online? How do you express your playful side? What words describe your brand? Great story and application, Becky. I can just see Jesus wading through those beach balls in your church slowly poppign them one by one and asking everyone to please sit back down and get miserba– oh, I meant comfortable — again.